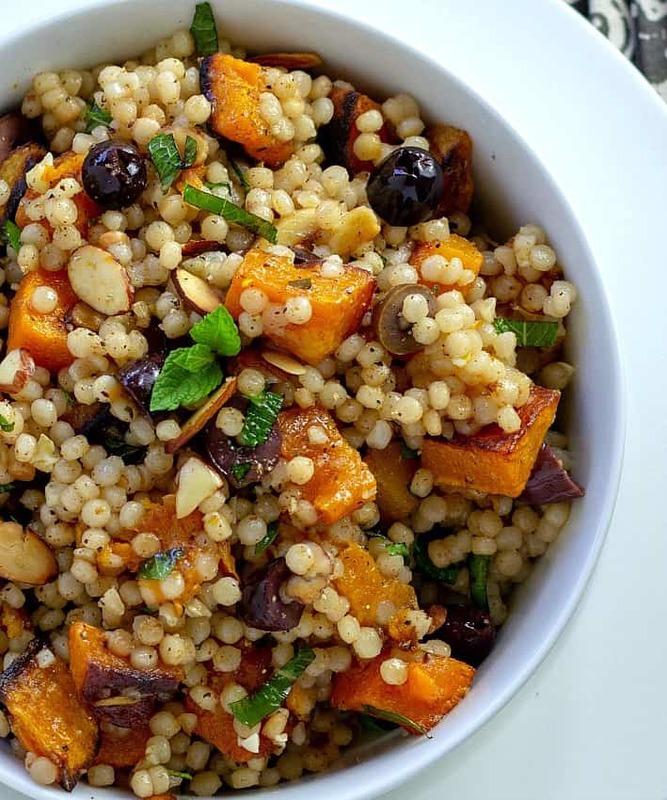 I’ve made Roasted Butternut Squash and Israeli Couscous Pilaf pretty much once a week since first discovering it in one of those bargain-priced cookbooks that Barnes and Noble features inside their “foyer” with a themed collection of recipes, this one being 28 Days of Clean Eating. 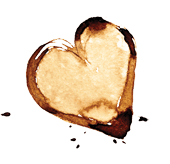 After reading the recipe’s ingredient list, what’s not to love? First, and important is the roasted squash- Two pounds of chunked butternut gets tossed with some coconut oil (fabulous! ), cumin, salt, and cayenne pepper before going in the oven. The coconut oil adds the perfect bit of light sweetness and the spice combination is spot on warm but bright at the same time; into the oven until it begins to caramelize at the edges. A few times, I forgot to toss during baking and one side got kind of black… still tasty! 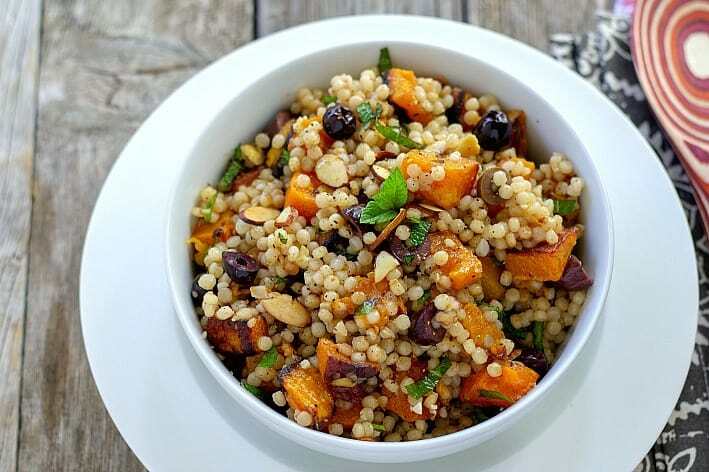 While the butternut squash is roasting, the Israeli couscous is toasted with some garlic and then boiled till tender. The couscous is ready to go pretty much at the same time the squash is ready. 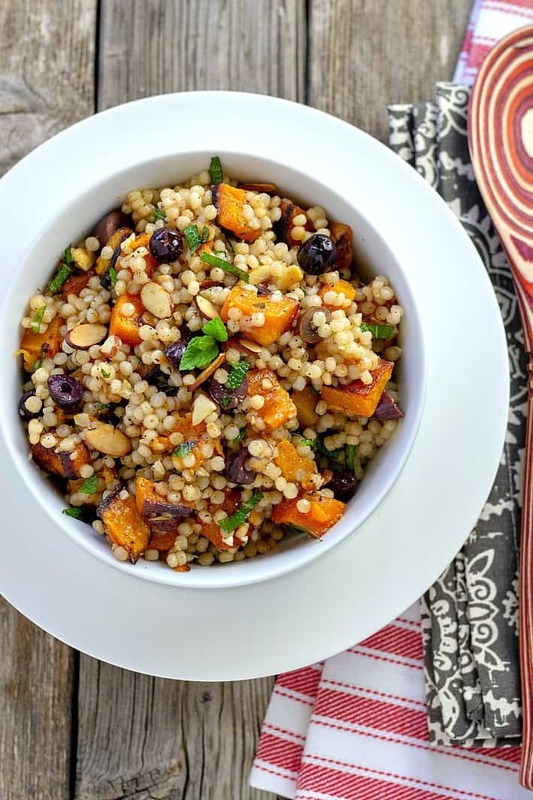 The addition of fresh mint, Kalamata olives, toasted sliced almonds, and lemon zest bring everything together in both flavor and texture. Truly a perfect Mediterranean dish that works as a side to chicken or salmon, we love it as a main dish. And leftovers, if you have any, are great at room temperature or reheated. This recipe is a wonderful side dish but also hearty enough to be served as a meatless main dish. Leftovers are delicious at room temperature or reheated. Preheat oven to 475F degrees, with oven rack in middle position. Coat a rimmed baking sheet lightly with coconut oil. Melt two tablespoons of the coconut oil in the microwave. Set aside. In a small bowl combine 1 teaspoon salt, 1/2 teaspoon black pepper, cumin, and cayenne pepper. Pour the melted coconut oil over the squash (By melting the coconut oil, it will coat the butternut squash fully but if the squash is cold, the oil will start to harden after added. That's totally fine because it's now on all the squash before turning hard). Immediately add the spice mixture from the small bowl, so the seasonings coat all the squash before the coconut oil hardens, if it's going to. Toss to fully coat the squash. Turn out the coated butternut squash on the baking sheet. Bake for 20 minutes or until tender and golden brown. Stir and toss the squash a bit at the 10 minute mark to prevent burning. While the butternut squash is roasting, in a medium saucepan, heat the remaining 1 tablespoon of coconut oil over medium-high heat. Add the couscous and garlic; saute' for 1 minute. Stir in the 2 cups of water and remaining 1/2 teaspoon of salt. Bring to a boil; reduce the heat, and simmer uncovered for 10-12 minutes or until the liquid is absorbed. 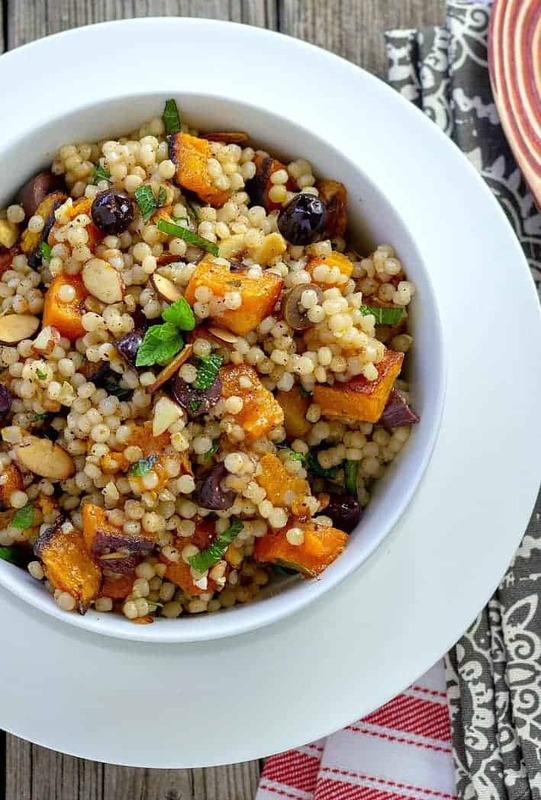 Remove the saucepan from the heat and stir in the black pepper, olives, mint, almonds, lemon zest, and roasted butternut squash. Toss well to combine. Taste and add more salt and pepper if desired. Serve immediately. Leftovers keep well in an air-tight container in the refrigerator for up to 7 days. 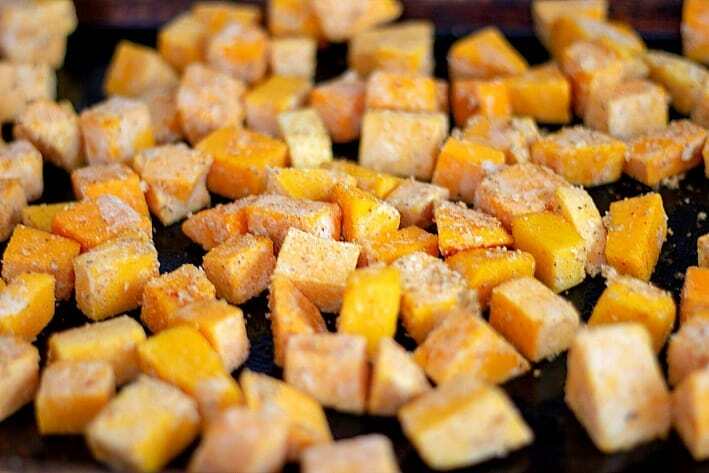 As stated in instruction #2, feel free to add more cayenne pepper and cumin to the butternut squash before roasting. For those of you who do not like any heat at all, you could reduce the cayenne to 1/4 teaspoon but I promise that cayenne in this recipe is a great addition. And as noted, if increasing the cumin, be careful as cumin can overpower. Trader Joe's and other grocery stores sometimes have pre-cut butternut squash in 12 oz. packages. You can use two of these and don't worry about needing a full two pounds in the recipe. If you're in a rush or forgot to toast the sliced almonds, feel free to add them un-toasted and they still add nice flavor and texture. Toasted almonds will increase the nuttiness and are preferable but not required. Want to add extra Kalamata olives? Great idea! 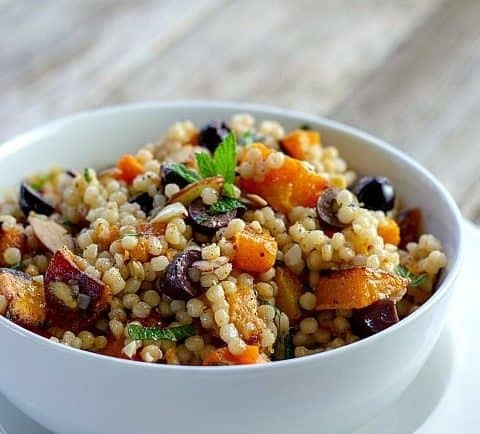 These nice salty olives go so well with the mint, squash, and couscous that I frequently add more. Recipe adapted from 28 Days of Clean Eating. This sounds really a new recipe to my ears. It look so delicious and procedure look so easy to follow, thanks for sharing this recipe with us I will definitely try this. OMg, this one is a winner. I would love to try making this. My husband would this for sure. This looks heavenly! And it’s healthy. Thank you for sharing your recipe! This looks so delicious, thanks for sharing, I will definitely have to try this recipe! This is such a great recipe! I just when a dish has a blend of strong flavors. I will definitely be trying this one out. You can never have too many side dish recipes, am I right?! Thanks Priscilla! Agreed, good side dish recipes are always a good thing. This one is great because it works as a side and as a meatless main. Thanks for stopping by! This looks and sounds so tasty! I love recipes that seem managable as I’m not exactly a masterchef, I’m also always in a hurry. I pinned this recipe as well and am looking forwards to trying it! Namra, this recipe is very easy. I think you’ll like it. Oh my goodness, this looks so good! I’ve been needing more healthy recipes, so I’ll give this a try! I love all of the ingredients that have gone into this! It looks both delicious and healthy. Thanks Sarah. It’s become a favorite regular in our house.